Adding a Digital Package to your GlideStop is an excellent way to increase the accuracy of your operation and alleviate tape reading errors. The Digital Package gives you two modes of operation. The first is the Absolute mode for normal measuring practices and the second is the incremental mode, for spaced machining operations. Our product features +/- .004" accuracy and has the ability to display English and Metric units. English units can be displayed in either decimal or fractional form. The Digital Display mounts on the GlideStop and can be used for right or left hand applications. 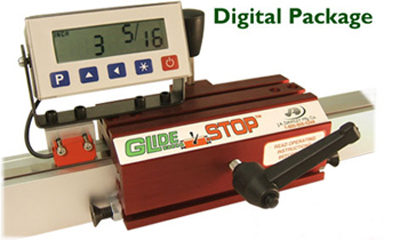 The Digital package can be added to any GlideStop. The ZeroBlock is an accessory to the Glidestop. It is used to obtain accurate measurements of cut parts. Designed to be used in conjunction with a digitally equipped GlideStop. The ZeroBlock is a temporary reference point that can be used to check part dimensions for quality control and part matching. The ZeroBlock is an easy to use accessory and can be placed, used, and removed without changing the calibration of your Digital GlideStop. Place the ZeroBlock on your fence. Slide the Glidestop against the ZeroBlock and press the INC/ABS key. Measure part between the contact bolts of the GlideStop and ZeroBlock. Remove ZeroBlock and press the INC/ABS key on digital display.